With this cookies and cream fudge, it’s an oh-so-easy choice for a bake sale, holiday or last minute treat. If you’re guilty of taking the top off an Oreo cookie and licking off the cream (like me), you’ll love this. With this oreo cookie fudge, you’ve got double the delicious cream filling. 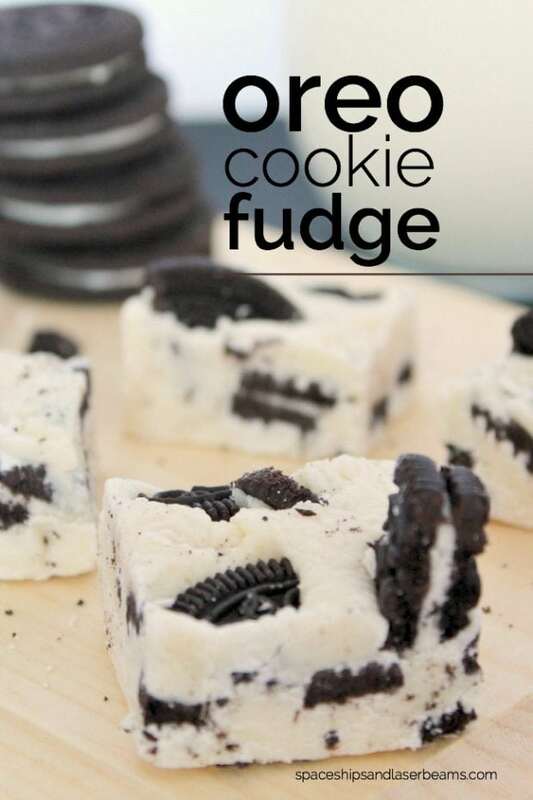 Who can resist fudge made with Oreos, your favorite sandwich cookie? 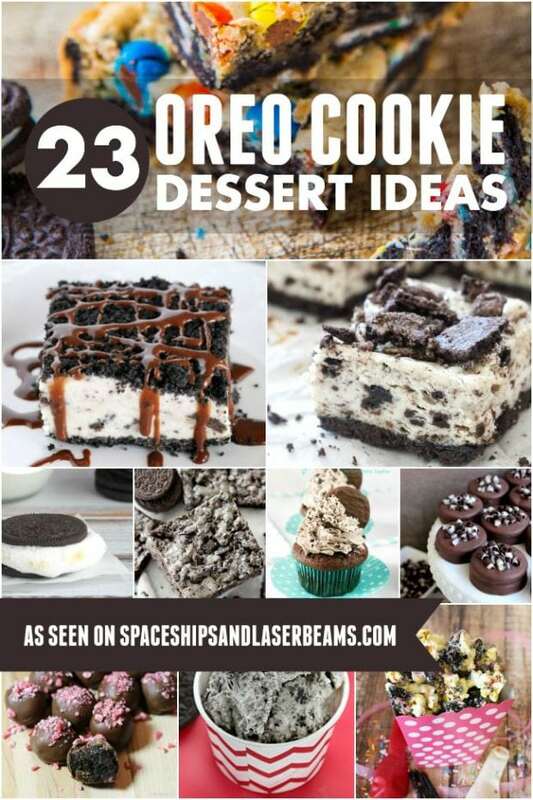 Don’t miss these Oreo Cookie Dessert Ideas. Or make the day extra special with Oreo Smores. I think I’m in love with all this awesome 5 ingredient fudge has to offer. With cream cheese, Oreo pieces and creamy white chocolate, you can’t mess it up! It reminds me of those Hershey’s cookies ‘n’ cream bars but thicker, richer and creamier. The sweetness of white chocolate cookies and cream fudge just melts in your mouth. I don’t know about you, but I’m a huge white chocolate fan. To be honest, it’s not in enough desserts! Oh boy, white chocolate galore! Thankfully this oreo fudge recipe makes a decent batch to last for days. My whole family is an Oreo loving family. 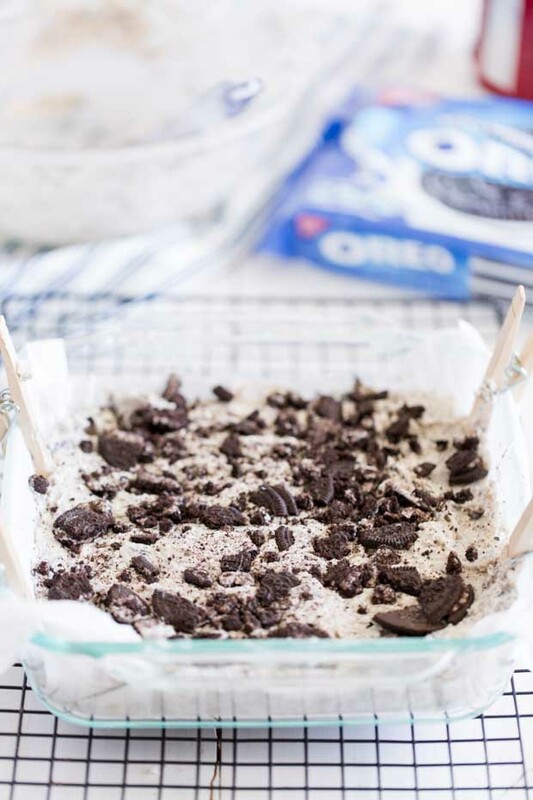 When we need our cookies and cream fix, this Oreo fudge recipe is out of this world. I think about how I have fudge waiting at home and it’s the best feeling. I admit it, my son isn’t the only one who has a sweet tooth! Even if you want to make the recipe for your mom to say thank you, this oreo fudge is a sweet homemade gift. 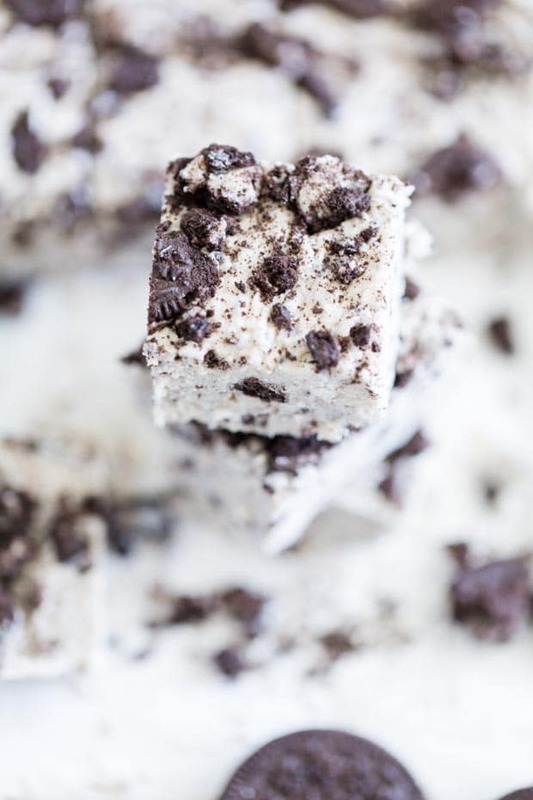 This homemade recipe for Oreo fudge is as easy as can be. 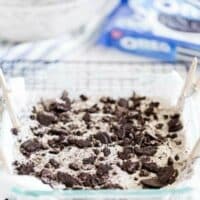 If your kids love Oreos, like mine, you’ll have most of the items in your home already! There’s no need for a candy thermometer or a ton of effort. Because of the white chocolate and cream cheese, this fudge will thicken on its own after chilling. In a big bowl, add cream cheese, confectioners’ sugar, and vanilla extract. I put everything right into the bowl of my mixer. Beat until smooth. Make sure there aren’t any lumps left. For the white fudge, heat the white chocolate in the top of a double boiler (or just a glass bowl set over a pot) over lightly simmering water, stirring constantly until melted and smooth. Remove from heat. You can use about 4 white chocolate candy bars (4.4 oz each) or about 3 cups of white chocolate chips (about 1 1/2-12 oz bags). The reason I suggest chopped white chocolate instead of chips is the chips don’t melt as well. But they do work! Break 3/4 of the cookies into at least thirds or quarters. Oreos break easily so they tend to make a crumbly mess if you’re not careful. 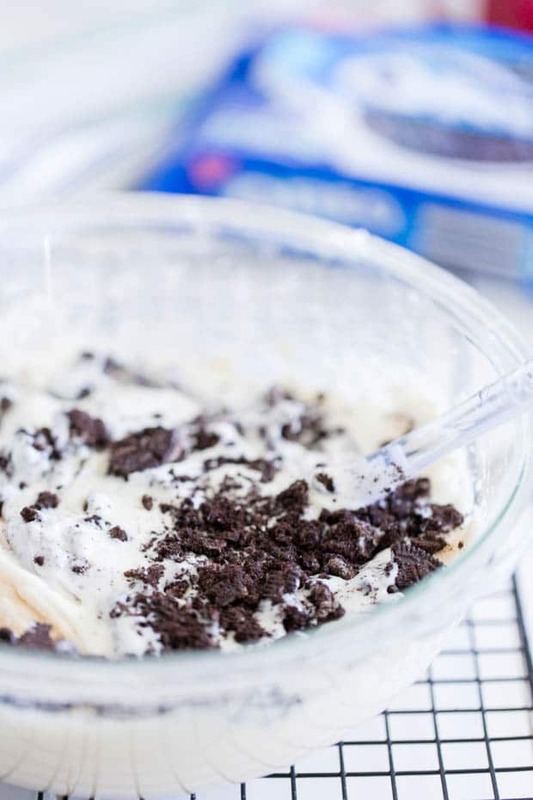 Stir the melted white chocolate and 3/4 of the crushed Oreo cookies into the cream cheese mixture. Try not to overmix so you can retain the bright white fudge color. Spread onto a small baking dish with parchment paper (8×8 pan if you have one). Instead of trying to cut the parchment paper to fit, 2 strips crossing over each other does the job. Put the fudge mixture into the pan and spread evenly over the bottom of the pan. Break the remaining cookies into large pieces and press into the top of the fudge. I like to press some extra white chocolate chips into the fudge as well. I know that seems like forever when you want a piece! If you have extra Oreos left over, dunk your Oreo cookies in some milk and relax while you wait for the fudge to cool. When it’s ready, slice into small squares. The texture should be soft and set up nicely. For an alternative to cream cheese, add a 14 oz can of sweetened condensed milk and 1 (7 ounce) jar of marshmallow crème (fluff). It’s crazy good! Mix with the melted white chocolate and stir until smooth. With marshmallow crème, it adds a little more sweetness and a nice, smooth texture to the fudge. As for storage, you can store this recipe in the fridge but the fudge is totally fine at room temperature. 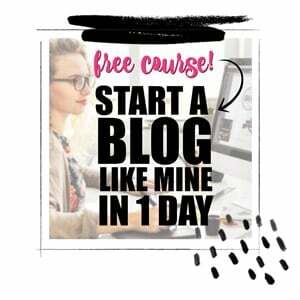 Just keep it in an airtight container and eat it all up in 1-2 weeks. I don’t think that’ll be very hard for you though! This recipe will also freeze well if you wrap each piece individually. Thaw by keeping it out to set at room temperature for a few hours. What’s great about Oreos is you can get a package of spring or winter Oreos to make this fudge festive! No need to keep things plain if this oreo fudge recipe can be all sorts of pretty colors. Have fun with it! The kids love to get involved and they learn how to bake. There’s even egg-shaped Oreos to have around Easter. The cookies are filled with purple crème. How amazing is that? The cute designs on each cookie make them pretty special. Whether you’re celebrating a holiday, giving to a friend or making with your kiddos, this dessert is bound to bring smiles. I love that it’s sweet but not too sweet. So, grab a hunk of rich, creamy cookies ‘n’ cream for yourself and enjoy! Stir the melted white chocolate and 3/4 of the OREO cookies into the cream cheese mixture. Slice into small squares. This stuff is rich but oh-so-good! You do not want to miss this recipe. It is perfect and so good. You wont be able to stop eating it. So, make plenty!